Filed to: Durarara! !Filed to: Durarara!! This is the story of a series of strange events, of a headless courier riding a black, soundless bike, a high school student in love with a monster, and of a mysterious gang which have slowly become the talk of the town. 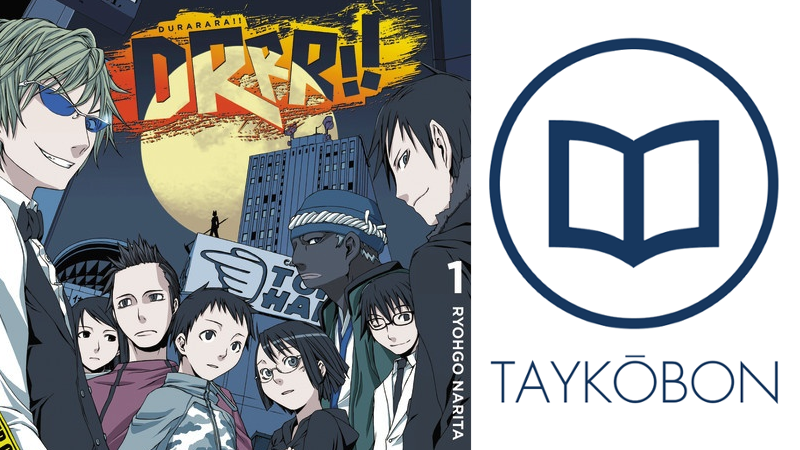 Tokyo’s Ikebukuro ward isn’t a stranger to odd and interesting events, and the stories of the people who live there are told in Durarara! !, the original light novel which spawned the hit anime. Mikado Ryuugamine moved to Toyko looking for excitement and adventure as he began high school, thinking this would be the end of his previously unremarkable life. However, he soon finds out that between rumours of a mysterious gang called the Dollars, a missing classmate and a slew of unsavoury characters, there is more to Tokyo’s Ikebukuro ward than he bargained for. Meanwhile, a headless dullahan named Celty searches for her lost head while performing courier missions in Ikebukuro’s seedy underbelly and a high schooler named Seiji Yagiri desperately pines after a lost but twisted love. These journeys quickly intersect into one twisted tale of love, rumour and mystery taking place in one strange city. If you enjoy ensemble casts as well as supernatural mysteries, you’ll probably like Durarara!! quite a bit. Durarara!! Vol. 1 is told somewhat unconventionally, alternating back and forth between the different stories of wide cast of characters. This works extremely well in creating an interesting plot, as author Ryohgo Narita does a great job making each of the plot-lines captivating in their own way. However, the real treat was the way in which each of these character’s stories slowly began to intersect with one another before eventually all coming together in one plot at the end of the book. I found this extremely satisfying, as the plots came together in a way that didn’t feel forced at all and enhanced the overall presentation of the story. In addition, I found that this alternating focus was great from a pacing perspective as it created a sense of momentum in the story, with one character’s perspective adding on top the others to create a more layered plot. The decision to alternate view points between a number of characters over the course of the volume also did a great job in making the characters more meaningful. I found the characters to be quite memorable because of the time invested in explaining their back stories, and I really liked seeing each of the characters’ views of the people appearing during their perspective. This really paid off in terms of my engagement with the plot because it became that more meaningful once the paths of these characters started to cross, making for a fascinating read. I can honestly say that I was invested in each character’s plot line, which was no small achievement considering just how many characters make up Durarara’s cast and this was definitely one of the best parts of the book. I also really enjoyed how Narita used the alternating perspectives to create a sense of mystery about the events of this book, with each chapter building upon the last. He managed strike a great balance between keeping some mystery in the plot while giving readers enough to stay engaged, and I found this quite satisfying as it never felt forced and added on to the excitement of the story. In addition, this really added to the re-readability of the book as I was eager to flip through chapters from the beginning of the book upon finishing and found that reading it again was significantly different experience in a number of satisfying ways. This is rare among light novels and is something I definitely appreciated as an added value to the story. The tag line on the back of the book says “The Good, The Bad, and the Downright Weird” and make no mistake, this is an accurate descriptor as Durarara!! can be downright weird at times. In particular, Celty and Shinra’s personal subplots came off as a little bit bizarre to me in general despite a good deal of time being spent fleshing out their emotions, and I had a hard time really becoming invested. I won’t spoil anything, but this extends to Seiji’s own subplot which was equally weird, although I do have to give it credit for the way it eventually adds to the plot. Just like its characters in some ways, Durarara! !’s weirdness is charming if not consistent, but it does make for a bit of an odd read at times especially once some of the key revelations are eventually made. While it might be said that Durarara!! Vol. 1 is a captivating read in spite of how weird it all is, it may be more accurate to say that how engaging it becomes is in part to how how endearing this bizarre cast of characters become as their stories intersect. The pacing is great and the variety of character perspectives used to tell the story make for an exciting read that has an impressive amount of re-readability. I can definitely say I was never bored during this book because of the sense of mystery that this story is infused with leading towards its satisfying conclusion, and I’m eager to find out more about what happens next to this strange cast of characters. Durarara!! Vol. 1 was published by Yen Press on July 21st, 2015. Authored by Ryohgo Narita and illustrated by Suzuhito Yasuda, the series is currently ongoing and published by ASCII Mediaworks’ Dengeki Bunko imprint. First published in Japan on April 25th, 2004, the series was completed in 2014 with 13 volumes, with volume 2 scheduled to be published in English on November 19th, 2015.